Although trained as a sailor, Frederick Pabst (1836-1904) would come to own the largest brewery in America, marketing beer in every state and around the world. With his brewing profits, Pabst left his mark on the city of Milwaukee, investing in real estate projects like the Whitefish Bay Pleasure Resort and the Pabst Theater and making financial contributions to welfare, education and arts organizations. Pabst's advertising, along with similar efforts by Schlitz, brought Milwaukee recognition and helped to create the city's favorable public image because of the extraordinary entertainment and services provided by brewers. 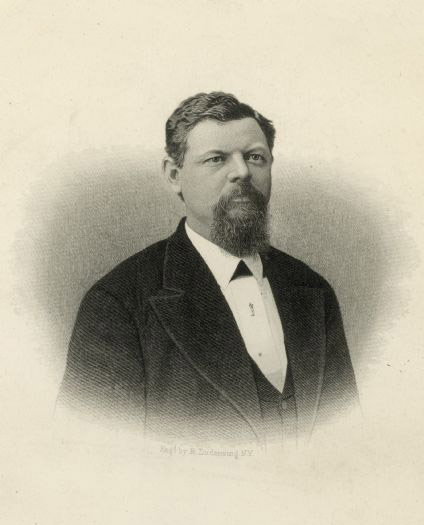 Frederick Pabst came to America from Germany with his family in 1848. Settling first in Milwaukee, the family soon moved to Chicago. As a young man, Pabst worked as a waiter before becoming a cabin boy for the Goodrich Line, a steamship company that operated on Lake Michigan. For eight years Pabst sailed the lake and studied navigation, and by 1857 he had become captain of the Goodrich steamer Huron. As captain of the Huron, Pabst met the woman who would change his life: Maria Best, daughter of Milwaukee brewer Phillip Best. They married in 1862. In December 1863, Pabst's ship was beached by a storm at Whitefish Bay, north of Milwaukee. Shaken by the incident, Pabst decided to join his father-in-law in the brewing business despite having no brewing background. Best Brewery had been making beer since 1844, but financial troubles and Phillip Best's failing health threatened to close the brewery by the 1860s. Pabst agreed to become a partner in the brewery and, two years later, Pabst bought out Phillip Best with his brother-in-law Emil Schandein. Pabst and Schandein began immediately to expand the market for Best outside Milwaukee, and by 1874 Best had become the largest brewery in the United States. Between 1879 and 1893 the company opened 40 offices around the country, 12 in Wisconsin alone. Best became Pabst Brewing Company in 1889. The famous Pabst Blue Ribbon beer came about through a combination of marketing and awards won at various fairs and expositions. Pabst's beer won gold medals at the Philadelphia Centennial Exposition in 1876 and the 1878 Paris World's Fair. In 1882 Pabst began tying blue ribbons around the neck of each bottle of its Select beer to distinguish it from other brands. People soon began asking for "blue ribbon" beer even though that was not the official name until the 1890s when Pabst beer won the blue ribbon at the 1893 Columbian Exposition in Chicago. His continual effort to improve his beers was paralleled by a similar drive to improve the social and cultural life of the city of Milwaukee. One of his projects was a traveling library that made German books available to immigrants who had settled in the area. Captain Pabst died on January 1, 1904, leaving the brewery to his sons. Prohibition hit the brewery hard, but the Pabst brothers were determined to stay in business. Pabst produced near beer, malt extracts, syrups and processed cheese until the amendment was repealed in 1933. Pabst emerged from Prohibition bruised but still in business, and continued to grow and expand in the mid-20th century until it was bought out in 1985.